The top-seeded boys’ basketball team captured the 2018 California Interscholastic Federation Los Angeles City Section Division III Basketball Championship against the number two-seeded Manual Arts High School, winning the game 65-44. “To be the first ones [in the school’s history] to do this, it felt great. My feelings and emotions were everywhere,” said Joseph Hernandez, a sophomore in the Visual and Performing Arts small school, about his emotions after capturing the title and realizing the history the team made. Unlike teams of years prior, the Jaguars were determined to not have a losing record during the season. “The journey to the championship game really began in the summer by working out with Coach Hicks,” said Jason Vasquez, a senior in the Technology & Media magnet. Hicks not only helps and motivates students on the court, but he does so off the court in the classroom as well. “[The players] are students in the classroom first. Our process was to have a 2.5 [GPA] in order to play. We set our bar high to not be like how we were in the past, to be men and not be young boys,” Hicks said. Not only did the Jaguars give their maximum effort in the classroom all season, but they did on the court as well, both during games and practice. “We built chemistry in the gym nonstop. It was an everyday thing. We put in blood, sweat, and tears as a team,” said Michael Ibarra, a junior in the Business, Innovation, and Leadership small school. The hard work and dedication in the gym seemed to pay off, as the team earned a 9-3 record in the Eastern League, the first winning record in school history. Unfortunately, the record was not enough to secure the Jaguars the Eastern League title they so desperately coveted. “We lost [our last league game] against South Gate that would have clinched us the league championship,” said Oscar Morando, a senior in the Business, Innovation, and Leadership small school about how the Jaguars let the Eastern League title slip through their fingers. Losing the Eastern League championship did not deter the Jaguars from bigger sights. “[Losing the Eastern League championship] fueled us to try harder and to be more aggressive in playoffs,” Morando said. The Jaguars earned the number one overall seed in the 2018 CIF Los Angeles City Section Basketball Division III Playoffs after their performance all season, which included a 17-8 overall record and a 9-3 league record. On the way to the championship game, the Jaguars routed Animo Venice High School in the first round, Roybal High School in the quarterfinals and Banning High School in the semifinals at Roybal High School. “The game against Roybal [stood out], because we all had fun. Everyone was laughing and having fun on the court and we all came together and played,” Hernandez said about the most memorable game en route to the championship game against Manual Arts. The semifinal versus Banning High School was Michael Ibarra’s shining moment, who scored 33 of the team’s 58 points, including eight-three point field goals. Ibarra’s performance earned him recognition from famous Los Angeles Times high school sports reporter Eric Sondheimer. “It was crazy. I had never experienced anything like it. It was something new to me and my team made me feel good and hyped me up on that,” said Ibarra about the exposure from the press that not only him, but the whole team received after their dominating performance. The matchup against the number one and number two seed was set for the final, and the Jaguars made sure they prepared. “The week before the game, we studied [how Manual Arts played] so we had a good idea about their style of play,” Hernandez said. Although the Jaguars were seeded number one overall in the bracket, Manual Arts had doubts about the Jaguars’ performance. “[Manual Arts] really underestimated us. They said that we couldn’t run with them,” Vasquez said. “It pushed us to work harder in the gym,” Ibarra said about how the doubts their opponents had about them fueled the team to practice and prepare harder. Straight from the tip-off of the game, the Jaguars commanded the game, going into commanding leads quarter after quarter and ultimately blowing out their opponents, 65-44. Coach Hicks credits their tremendous victory to the team’s transformation into a defensive team that limits their opponents scoring and being smarter on offense. “Our entire season rests on defense. Offense sells tickets, defense sells championships,” Hicks said. “We expected Manual Arts to put up a fight, but, at the end of the day, we competed, and we did what we were supposed to do,” Vasquez said about the blowout win. “Our slogan all season has been ‘Trust the Process.’ To look at where we were in August and look at where we are now, [it’s amazing]. For these kids to have the whole school behind their backs in the championship game is something these kids never had,” Hicks said about the support and confidence the student body had on the team, and the players had on each other to win the championship. Principal Jesus Nuñez presented the players and coaches with their championship medals and presented the championship plaque to Coach Hicks. “I was beyond happy because it’s the first time [South East] has ever done something like that and I’m just happy to be part of it,” Morando said. 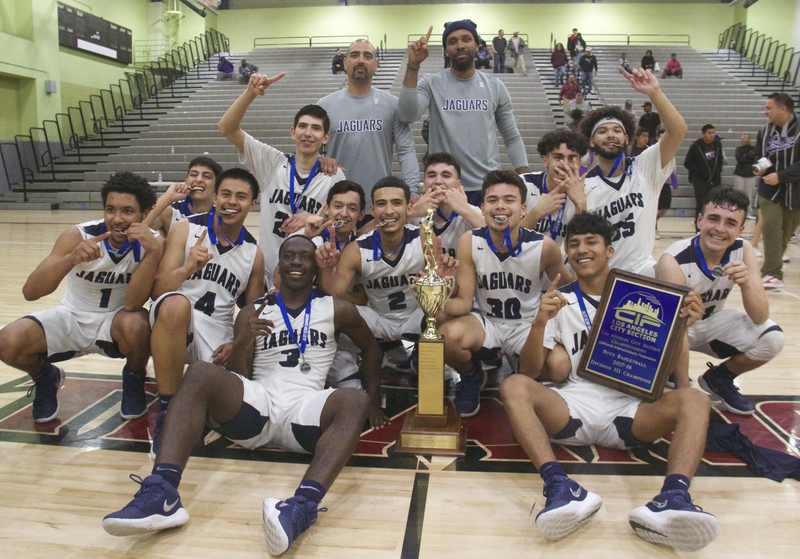 After their blowout win against Manual Arts, the Jaguars earned the number nine seed in the 2018 CIF State Division V Basketball Championship bracket, where they faced the number eight seeded California City High School. This was the first year that the Jaguars competed in state playoffs, and managed to pull off the upset win by a score of 76-63. “Going to California City, the bus ride was long and tiring but we took care of business,” Hernandez said about traveling three hours into the Mojave Desert to face California City and pulling off the upset win. The next round, the Jaguars faced the number one overall seed in the state, Santa Clarita Christian. Unfortunately, the Jaguars Cinderella-season came to an end after losing the game 66-42. “That loss was tough. Their style of play was faster and it was real different. We took it as a learning experience,” Ibarra said about the tough loss for the Jaguars against the top team in the state. The Jaguars accomplished a lot this season, and Vasquez hopes that the younger guys on the team can learn from the success of this year’s squad. “I think that the [younger] players will look up to us and use this as motivation. Seeing us win a championship in our first year, they’ll believe that they can do it,” Vasquez said.